Thank you everyone who signed up for our 150 free spay & neuter surgeries. Those were all the spots available and they filled within the first four days! Click here to learn more about our ongoing spay & neuter program for cats and pit bull type dogs. 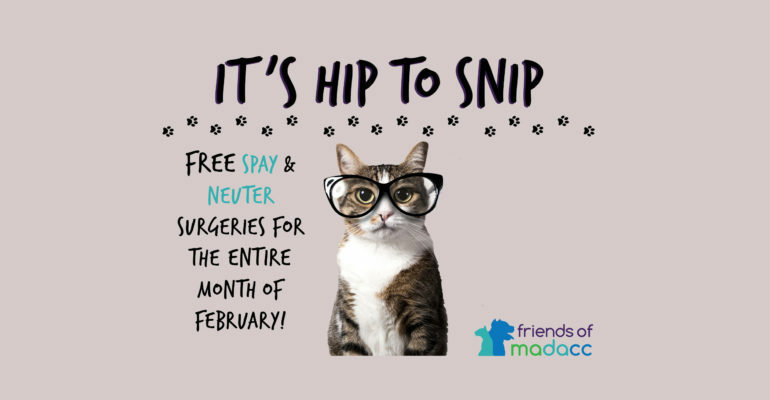 February is National Spay/Neuter Awareness Month and Friends of MADACC is raising awareness by offering FREE spay and neuter surgeries for cats for the entire month of February! There are a limited number of surgery spots being offered, so sign up today! Spaying and neutering pets keeps them healthier, safer and reduces pet overpopulation at shelters. 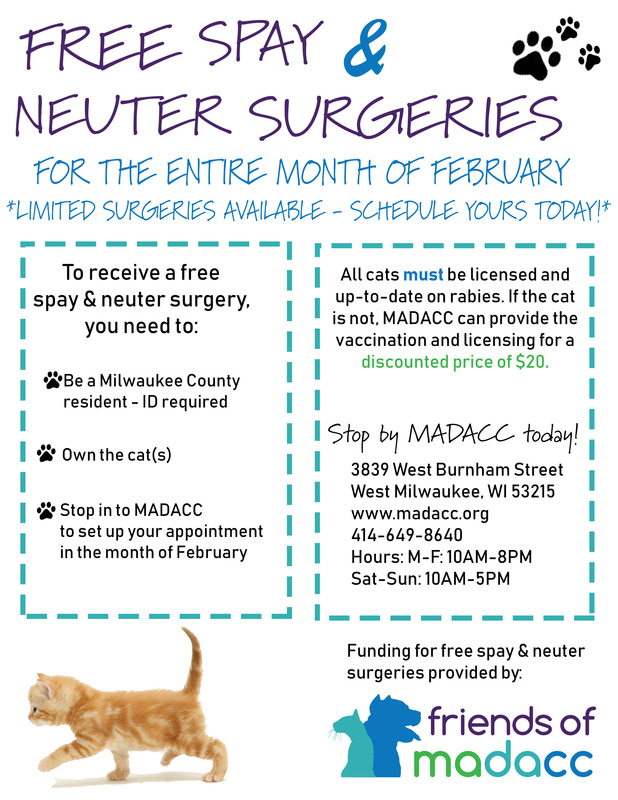 Kitten season is just around the corner and these surgeries can prevent a lot of unwanted litters from potentially ending up at shelters in Milwaukee County this spring. In addition, pets who are spayed or neutered have reduced incidences of cancer and other diseases and are less likely to wander away. Own the cat(s) that they would like spayed/neutered. Complete the scheduling process during the month of February. Note: all cats need to be up-to-date on rabies and licensed. Please provide proof of vaccination or MADACC is offering a discounted price of $20 for both the vaccination and licensing. To schedule, stop in to MADACC during business hours (Monday-Friday 10:00am-8:00pm and Saturday-Sunday (10:00am-5:00pm). See contact information below. Download this flyer to hang up at your place of work or elsewhere. Download these social media graphics and share online!